I’d like to thank our reader Ann for sharing Bandit’s journey. When your companion is diagnosed with a serious illness, it throws you into a seemingly endless roller coaster of emotions and decisions. It’s a gut-wrenching time and only those who have gone through it can truly understand it’s depth. I would like to thank everyone that has shared their story and offered comfort to those who are in the midst of caring for a sick companion, or worse, dealing with their loss. I hope that you will continue to provide us with updates – sometimes that glimmer of hope is the only thing that gives a bit of relief. 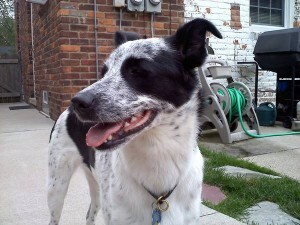 Reader Ann posted last year shortly after Bandit was diagnosed with Evans. Thankfully, Bandit responded well to her initial treatment and continued to progress to the point that she was taken off all medications four months later. On February 27th, it will be a year from the original diagnosis. It’s import to be reminded that there are success stories, even with some of the more serious illnesses. It’s a brutally difficult experience to endure, and I hope that this site can offer some level of comfort and support during a difficult time – and see you through to a happy ending.